Irwin Bismark Topperwien - Brighton technical school, Victoria, Australia. Irwin Bismark Topperwien, known to his colleagues and the students at Brighton Technical School, Victoria, as Ian Topperwien, was born in Port Wakefield, South Australia on the 1st. November, 1887. He spent the first 38 years of his life in South Australia before taking up residence in the State of Victoria, where he died in 1960, aged 73 years. His preliminary schooling and University study were undertaken in South Australia, where he took the degree of Master of Arts and Bachelor of Science in the University of Adelaide. He distinguished himself both as a student of classics and chemistry. Awareness of the need for technical education in an increasingly industrial and technological society led him to take up a teaching position in a Victorian technical school in 1924. After only a few years, during which he gained valuable experience at South Melbourne, Wonthaggi and, as acting Principal, at Beechworth, Mr. Topperwien was appointed Principal of Wangaratta Technical School and very ably filled the position for six years. In 1935, when the Principal of Brighton Technical School, Mr. Percy Everett, became Chief Architect for Victoria, Mr. Topperwien was offered and accepted the position of Principal of the school. For seventeen years he took the school from strength to strength as he guided the school through periods of expansion and the rigours of World War II. Towards the end of 1939 the then Governor of Victoria, Sir Winston Dugan, visited the school to inaugurate the first Brighton Technical School Cadet Corps. Photographs of Irwin Topperwien taken at that time, show the strain on his face and the effect of the stress on his physical being as he carried the responsibility of providing a first class education for students under wartime conditions. At the same time knowing that some of his teachers, and many of his former students, were headed for the battlefields of Europe and Asia. The intellect and determination of this great statesman enabled Brighton Technical School to not only survive the five years of Australia’s involvement in World War II, but also to do the preparation for the role the school must play in the re-education of thousands of returning service personnel at the end of the war in 1945. The Brighton Technical School’s annual enrolment figures increased dramatically. In the year 1946 - 2,007 students attended the school and, in the following year, 1947, the enrolment figure increased to 2,077. Not only was Irwin Topperwien a great administrator, he was prepared to intervene when he believed the welfare of one of his students was put in jeopardy. He believed his students were individuals whose welfare was always uppermost in his mind. The achievements of Irwin Topperwien may be regarded as a legacy to his students and the wider community. Mr. Topperwien's farewell. 'Our Principal's farewell message. May this ‘Tribute’ to Irwin Bismark Topperwien remind all who knew him at Brighton Technical School, that we were privileged to have received our education under his care and guidance. Topperwien home. 10 Foam Street, Hampton, Victoria. He died at his home at 10 Foam Street, Hampton on the 23rd. November, 1960, from Carcinoma of the lung and Atheroma. He was survived by his wife, Florence, (10-1-1902 - 2-6-1984), and his daughter Elaine Bernice, (8-2-1929 - 23-5-2002). 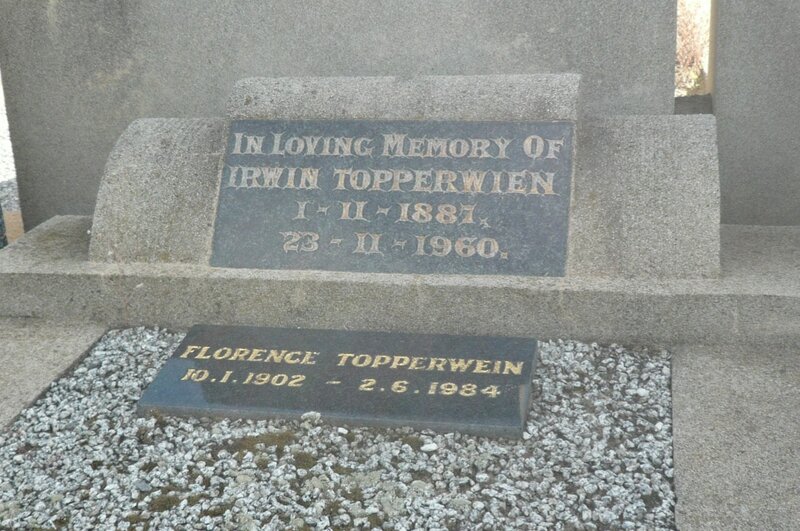 Irwin Topperwien was buried in the New Cheltenham Cemetery, known as Cheltenham Memorial Park, Wangara Road, Cheltenham. Grave Reference : Methodist, Row 206, Grave No. 5. In Loving Memory of Irwin Topperwien. 1-11-1887 - 23-11-1960. Florence Topperwien. 10.1.1902 - 2.6.1984. 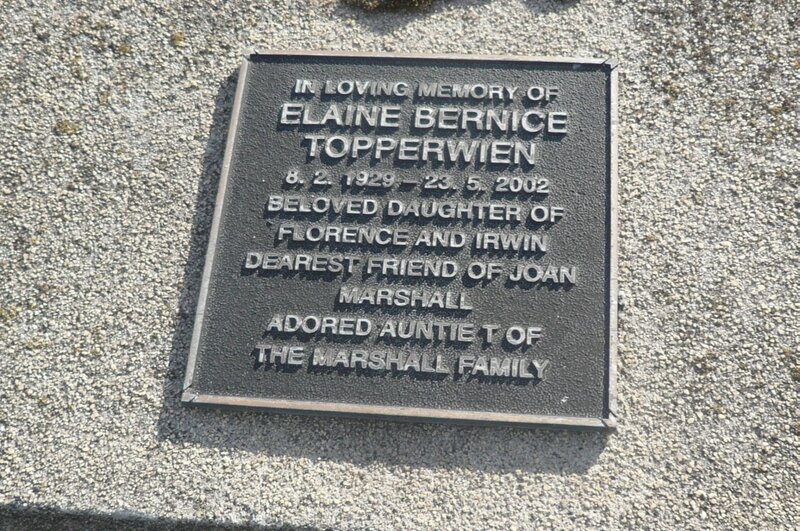 In Loving Memory of Elaine Bernice Topperwien. 8.2.1929 - 23.5.2002. Beloved Daughter of Florence and Irwin. Dearest Friend of Joan Marshall. Adored Auntie T of the Marshall Family. Death Certificate of Irwin Bismark Topperwien, 23rd. November, 1960. Brighton Technical School Magazine, “Sea Spray” 1952. Page 4. Brighton Technical School 1951. “Commonwealth Jubilee Year”. Exhibition of School Work. Page 6. Records of Cheltenham Memorial Park, Wangara Road, Cheltenham.